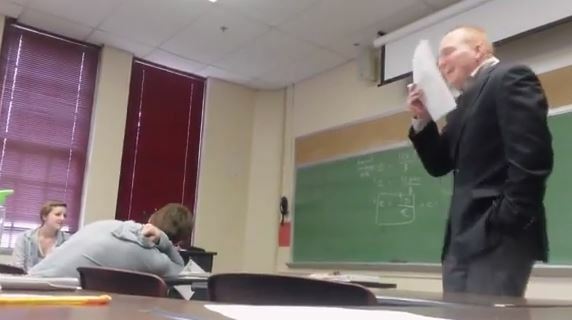 Home Tags Posts tagged with "april fools prank"
A professor’s strict no phone-policy set one student up to pull the ultimate April Fools’ prank in class, which was caught on video and is now going viral. Aquinas College students play a prank on their hilarious Macroeconomics Professor Stephen Barrows. Stephen Barrows, an economics professor at Aquinas College in Grand Rapids, Michigan, has a strict policy when it comes to phones in class – if it rings, you have to answer the call on speaker phone. Student Taylor Nefcy made sure the phone call “confirming” her pregnancy from an out-of-the picture father would be played loud and clear for the class. The prank went off without a hitch and a YouTube video of it has spurred an international reaction, drawing almost 14 million views by April 8. The video has already been translated into French.